Free Image OCR 7.3.6 - Download Win Apps. Turn your scanned PDF and image filesinto fully searchable and editable text.. When the documents with which you usually work are in scanned PDF or image format, you can always resort to FIO to carry out these processes. FIO has a very quick optical recognition engine, and allows the possibility to convert any PDF into a text document without problems. The produce is reduced to the simple fact of opening the PDF documents and then clicking on "OCR". 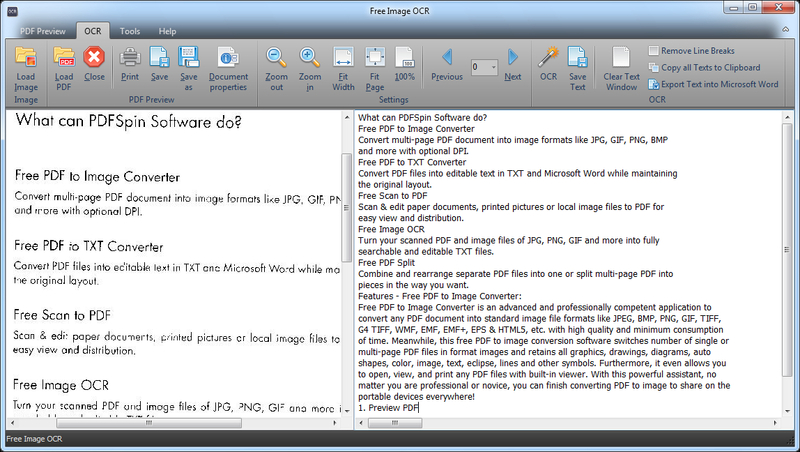 In comparison to Free Image OCR is a text and character recognition software that converts images, Image-only pdf, bmp, tiff, jpg, png, tif files to searchable and editable MS Word, pdf, doc, text, html files with accurate text formatting, spacing and fonts.